A selection of sensors for monitoring of weather parameters. 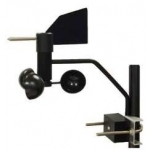 Analog Output Anemometer for MicroPower Weather Station. Professional Rain Sensor with High accuracy and up to 0.001mm resolution. Heated. Multiple Output interfaces. Solar Radiation Sensor 0-3V output. Ultrasonic Wind Speed and Direction sensor with SDI-12 Communication.